Angra dos Reis – translated from Portuguese means ‘Creek of the Kings’. This state of Brazil was first discovered back in the early 1500’s by the Portuguese naval fleet. An archipelago of 365 islands, one for every day of the year, Angra is a favorite vacation spot for many in the region and even for the whole country. 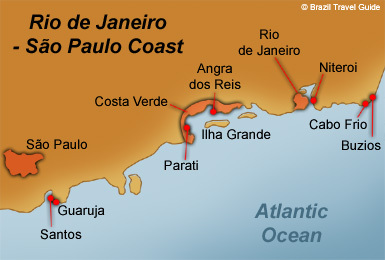 We came about it through Brazilian friends who have a place on the ‘Big Island’ (Ilha Grande). Angra dos Reis – on the coast of Brazil between Rio de Janeiro and Sao Paulo. A handful of the 365 islands of Angra dos Reis, Brazil. Angra is a fairly remote area. From Sao Paulo, there is one windy road along the coast and another through the tropical hilly terrain, both of which take a good six plus hours to go the 240 miles. From Rio de Janeiro, there is one windy road, mostly along the coast, that takes three plus hours to go 90 miles. The best way to arrive is by plane, and as luck would have it our friends just happened to have their own plane – go figure! 🙂 My first small plane ride ever and I have to experience landing on a landing strip that starts at the tip of an ocean inlet and end at the base of a mountain, in the rain! Thank goodness I didn’t have a heart attack then and there or I would’ve missed the most magical next 3 days of my life. Coming in for a landing to the landing strip at Angra dos Reis regional airport. Besides tourism, the area is noted for fishing, agricultural products (bananas, coconuts, oranges, hearts of palm and sugar cane), steel export and transporting oil. Many residents on the island are in the service industry – the culture in Brazil in general is very service oriented. Our friends have paid staff in the house to look after any and all needs of the family: cook, nanny, clean, garden. They have a separate crew to man their 78-foot yacht. Our friends are humble and full of gratitude to their staff and the staff is like family – it is viewed as an employer/employee not a hierarchy. The crew on our friends boat coming into the marina to pick us up from a day at one of the many islands of Angra dos Reis. The attitude and attire are laid back in this very temperate climate where the high temps throughout the year range from 77 to 87, and the lows range from 62 to 77. Because they are on the beach or on the boat almost every day, our friends tend to live in swimsuits and flip-flops. The rainy season is from December through March (their summer) where they average 10 inches of rain a month. One of the nights we were there – I think they might have received their rain total for the month. It rained, and rained, and rained! I love a good rainstorm as much as a crystal clear day or a starry night! View from the beach home we found ourselves lucky enough to be staying at while in Angra dos Reis. A dark and eerie sky ready to open up and unload several inches of rain. Upon arriving at our friend’s home, we were told to don our bathing suits – we were heading right out on the boat to go and check out one of their favorite islands known as ‘Dentist Island’ – apparently a century or so ago it was owned by a very prominent dentist in the area. To me it was what beach dreams are made of – a deserted looking island right out of a movie scene. The boat was anchored offshore about 50 yards and we swam to the shore for a run up and down the beach and then swam back to the boat for our first caipirinha of the day, and a feast of fresh fruit, veggies and fish dishes. A ‘life is good’ moment in Angra does Reis. My husband and daughter both tried stand-up paddle boarding – one fared a bit better than the other, but I won’t say who, other than ‘nicely done sweetie!’ 🙂 Our hostess has it down so well she paddle boards all over the bay with her dog Louie sitting serenely at her feet. After another caipirhina or two, it was back to our friends amazing beach house. Our hostess designed it and utilized boulders from the area to create unique room settings. My daughter getting the hand of stand-up paddle boarding in the quiet bay of Dentist Island. Louie waiting to go paddle-boarding! The next morning arrived bright with sunshine. After a breakfast of a tapioca crepes filled with eggs and ham, and more of the islands fresh fruit, it was off to hit the links for the older adults. A fun little course that winds it way through the foothills within a driver distance of the beach house. We saw a giant hamster, aka Capybaras, many of us saw on the Olympic coverage from Rio. Golfing in these tropical regions sure is humid and sweaty, but you do stay loose! Luckily we were brought cold beers and more fresh fruit at the turn to keep our hydration levels up. Getting up close and personal on the golf course with a local capybara. Not too many golf courses you have to hit over ancient ruins to get to the green. After a quick freshen up back at the beach house it was off the magical island of Paraty – a town built back in the early 1800’s reminiscent of a European colorful hamlet. Buildings of white, trimmed with a multitude of different colors, veined with concave cobblestone streets so rain drains towards the ocean. The town is filled with boutique shops, bookstores, coffee shops, restaurants and ice cream shops. We bought some artifacts from Amazonian tribes at one of the stores. We had an ice cream cone for lunch, because our host asked us not to eat too much as he was having fresh lobster flown in and was cooking for us tonight – which meant he oversaw his cook grilling the lobster! 🙂 Twenty plus lobster tails for 5 of us – you do the math! Teamed with another caipirinha or two, and a couple of shared bottles of wine meant a deep sleep for all. The colorful tourist boats in the Paraty Harbor, reading to take guests out on the water for a Paraty style party! The colorfully trimmed white buildings of Paraty, with concave cobblestone streets. Needless to say we slept in the next morning. But before our final boat trip back to the plane to take us to our next destination – Rio de Janeiro, we all took a nice long bike ride. The guys went one way and the gals took another way, back through the golf course where we just missed riding over a coral snake, along a beach to see a new Fasano resort in development, and past a few more of the docile capybaras. My daughter and I on one last trek, on bikes, through the beauty that is Angra dos Reis. A couple more Capybaras lounging by the river on the golf course we biked through. My daughter and our extremely gracious hostess for our time spent at Angra dos Reis. All in all a this was a trip unlike anything any of us had ever experienced – mainly because of the hospitality of our friends, but it is certainly a destination worth checking out for anybody. Albeit it a challenge to get there, everything is in place to create an unforgettable experience for any new comer to the area. Since we only experienced 3 of the 365 islands we will definitely be putting Angra dos Reis on our ‘return to’ travel list. Stay tuned for Brazil Part 3: Rio de Janeiro and the Global Gallery from all three stops in Brazil. This entry was posted in Blog Posts, Brazil, Travel Writing and tagged Angra dos Reis, Brazil, Caipirinha, capybaras, Ilha Grande, North Dakota snowstorms, olympics, paddle boarding, Paraty, Portuguese, Rio de Janeiro, Sao Paulo. Bookmark the permalink.